I generally like mokko gata (4 lobed) tsubas, but I wasn't crazy about the ones first offered on the SBG Custom Katana. 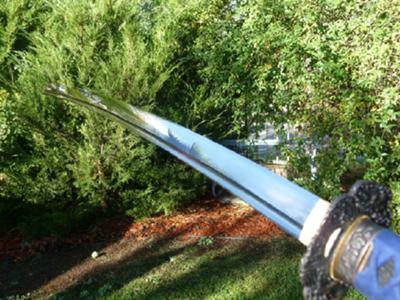 However, when I say the B116 tsuba offered with version 2.0 of the sword, I had to pull the trigger and get one. 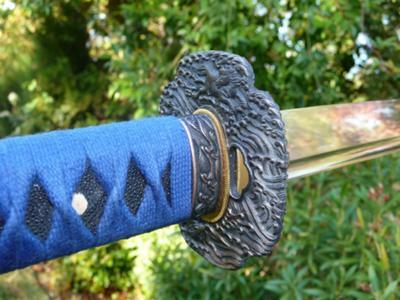 I liked the wave design of the tsuba and wanted a darker looking sword, so I went with the blue ito and black same. I also chose the relatively dark C9 fuchi & kashira and the black textured saya to finish off the design. I couldn't be happier with the way it came out.